The question anesthesiologists always ask themselves when a person with a lung disease must undergo a planned operation, is whether this person is likely to develop severe postoperative pulmonary complications, or actual respiratory failure. To answer this question, many have recourse to preoperative respiratory function tests. But can the risk of postoperative pulmonary complications be predicted by clinical examination and respiratory function tests? Yes, it is possible to predict the occurrence of postoperative pulmonary complications to a certain degree. This page discusses criteria for estimating the chance of postoperative pulmonary complications for non-thoracic surgery. The reason for this is that thoracic surgery, especially lung surgery, has somewhat different requirements than surgery performed on the rest of the body. To begin with, we must ask the question; "What are the performance criteria for the lungs of a surgical patient?" What must the lungs do? To begin with, the anesthesiologist must have a clear idea of what is expected from the lungs of a patient undergoing a surgical procedure. So what are the performance criteria for the respiratory system of a surgical patient? The lungs must get sufficient oxygen into the body to oxygenate the blood. The lungs must eliminate carbon dioxide from the body to prevent carbon dioxide accumulation. The patient must be able to generate a productive cough, otherwise mucus accumulation will occur resulting in atelectasis and/or lung infection or pneumonia. The patient must be able to significantly increase their respiratory minute volume to compensate for factors such as increased postoperative metabolic rate, elevated body temperature, possible infections, pneumonia, etc. Inability to significantly raise and sustain an elevated respiratory minute volume results in exhaustion and respiratory failure. How does the practical anesthesiologist proceed to assess the perioperative risk of postoperative pulmonary complications of all sorts in the light of these requirements? Before beginning with this, it is first worthwhile examining the consequences of postoperative pulmonary complications. People with pre-existing pulmonary disorders are simply more likely to develop postoperative pulmonary complications, and the very fact of developing such pulmonary complications is related to the postoperative survival of patients undergoing operations. Long ago in the 1960's, a simple system of evaluation of functional activity was related to survival of ventilator support in the intensive care. This revealed that short and long-term survival of respiratory failure bore a direct relation to the pre-existing physical activity status of the person (see table below with data from Jessen 1967). Advances in respiratory therapy and care since the 1960's have undoubtedly improved these survival figures somewhat, but the reality of the relationship they demonstrate is still relevant - pre-existing disease increases the chance of dying. This is also clearly demonstrated by modern studies of longer-term survival of postoperative complications. One study of people aged 70 and older clearly showed that physical functional decline after operations was unrelated to the occurrence of postoperative complications, but more related to the presence of comorbidity existing at the time of the operation (Manku 2003). The message is the same - people with significant pre-existing comorbidity are more likely to die and deteriorate after undergoing major illness or a major operation. Returning to the subject of postoperative pulmonary complications, what are factors predisposing and predicting the likelihood of postoperative pulmonary complications? Most studies reveal similar consistent results. The magnitude, duration, and location of a planned operation, as well as pre-existing comorbidity are important factors determining the likelihood of postoperative pulmonary complications (see Brooks-Brunn 1997, Pereira 1999, Sogame 2008, Smetana 1999). This list makes it very obvious which patient categories and operation types can be considered higher risk. So when a person with pre-existing severe lung disease undergoes such an operation, the risk becomes considerably higher. What are the simple clinical indicators of higher risk of postoperative pulmonary complications? This brings us to an analysis of preoperative respiratory function assessment according to the basic functions of the lung. Can the lungs get enough oxygen into the body? How well do the lungs function in their task of getting oxygen into the body? Lung function declines as age, and so the PaO2 also declines with age, as is shown by the practical regression equation giving the decline of PaO2 with age for healthy supine adults (Wahba 1983). Viewing the results of this equation in combination with the oxyhemoglobin dissociation curve reveals useful clinical insights. 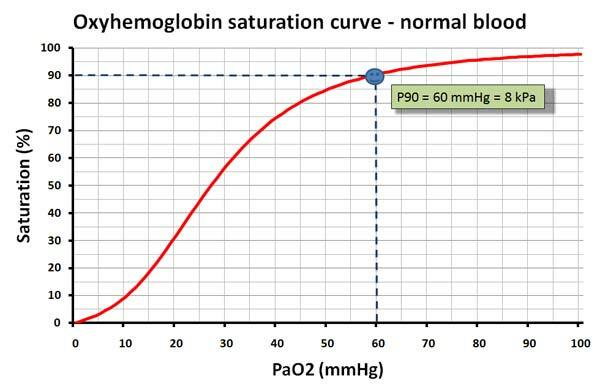 For clinical purposes, the most useful PO2 is the P90, the point at which hemoglobin is 90% saturated. A SpO2 ≤ 90% means that a person has a PaO2 ≤ 60 mmHg (8 kPa). When this fact is vombined with the above equation, it means that even a healthy 100-year-old adult lying in a supine position will have a PaO2 of about 75 mmHg (10 kPa). Combine this with the fact that the P90 of hemoglobin = 60 mmHg (8 kPa), and you realize that all healthy adults lying in a supine position will have a SpO2 ≤ 93-94%. If a person attending the preoperative assessment clinic has an SpO2 ≤ 90% when breathing air, then this person has compromised respiratory function, and requires further intensive investigation to investigate the cause of this reduction of lung function before planning any elective surgery. It is always worthwhile measuring the SpO2 of all emergency patients as they lie on the operating table while only breathing air, especially those about to undergo major abdominal surgery, or are septic. Those patients with a SpO2 ≤ 90% are at the point of developing respiratory failure. An operation will only make this situation worse, especially for those patients who must undergo an intra-abdominal procedure, and even more so for those with a pre-existing sepsis. These people will nearly always require postoperative ventilator support. In fact, upon measuring such a SpO2 in these patients, it is worthwhile arranging for the patients concerned to undergo postoperative ventilator support. Can the lungs eliminate the carbon dioxide produced by the body? Carbon dioxide is a normal product of metabolism eliminated by the lungs. But some people with severely compromised lung function cannot eliminate sufficient carbon dioxide though their lungs to prevent hypercapnia. Postoperative respiratory depression due to anesthetic drugs, opiates, and sedatives will worsen this situation, as will the effects of surgery on respiratory function. So which persons are likely to have carbon dioxide accumulation? Forced expiratory volume in one second (FEV1) ≤ 50% normal (Cloosterman 1998). FEV1 ≤ 600 ml (Mannix-1999, Montes de Oca 1998, O' Brien 1999), or FEV1 ≤ 27% normal (Scano 1995). Vital capacity (VC) ≤ 1700 ml (Montes de Oca 1998). Hypoventilation of large part of the lungs expressed as a FEV1/VC ratio ≤ 32-58% (Cloosterman 1998, Mannix-1999). Carbon dioxide accumulation due to postoperative respiratory depression in people with pre-existing hypercapnia can cause an increased degree of hypercapnia, resulting in altered mental function, or even coma. Accordingly, practical clinical practice entails the following. Perform a blood gas analysis on patients likely to accumulate carbon dioxide, (i.e. FEV1 ≤ 600 ml, FRV1 ≤ 27% normal, VC ≤ 1700 ml), to determine whether carbon dioxide retention is actually present. Arrange postoperative ventilator support for patients with carbon dioxide retention who are to undergo major abdominal surgery, or other surgery likely to cause postoperative pulmonary complications. Can the patient cough effectively? Coughing is the mechanism by which the lungs clear accumulated lung secretions. Coughing is a complex process initiated by stimulation of cough receptors. After an initial inspiration with wide abduction of the vocal cords, a forceful 0.2 second expiration begins together with a forceful adduction of the vocal cords building up a high pressure in the lungs. This is followed by sudden abduction of the vocal cords and subsequent rapid flow of air out of the of sufficient flow velocity to clear secretions from the lungs (Boitano 2006). And this sudden high flow of air out of the lungs leaves the lungs through the trachea. So what are the tracheal airflows generated in normal coughing? Cough peak flow rate (CPFR) varies between 300-1200 l/min (3-20 l/sec) (Singh-1995). Peak expiratory flow rate (PEFR) and CPFR are related. Studies show that the PEFR is about 56% of the CPFR (Suarez 2002). A study performed with coughing through endotracheal tubes showed that the minimum PEFR associated with adequate clearing of lung secretions is about 82 l/min (1.37 l/sec) (Smina 2003). Accordingly the minimum CPFR associated with adequate coughing is about 145 l/min which agrees with the results of other studies (Bach 1996). Lung secretions will accumulate in a person who cannot cough effectively. Accumulation of lung secretions can cause atelectasis, and accumulated lung secretions form an ideal substrate for bacterial lung infections of all sorts. Either of these events or both can cause respiratory failure. Practical clinical use of the PEFR is as follows. A patient with a PEFR (not the CPFR) ≤ 82 l/min (1.37 l/sec) is unable to cough adequately and will very likely develop sputum retention with atelectasis and lung infections after operation. Note that this PEFR is measured in patients with endotracheal intubation, which makes it possible to suction secretions if needed. So it is always advisable to use a reserve capacity. Inthis case use a PEFR = 2.5 L/sec = 150 l/min as a cutoff point below which coughing of sputum becomes less effective. Such patients should be admitted to an intensive care unit postoperatively for intensive physiotherapy and eventual ventilator support. Can the patient sustain an increased respiratory minute volume? Increased postoperative oxygen consumption due to increased metabolism due to the effects of major surgery, fever, sepsis, and postoperative pulmonary complications of all kinds, require the affected patients to increase their respiratory minute volume. This is accomplished by combinations of increased respiratory frequency and/or tidal volume. However, some patients with pre-existing abnormal lung function are unable to increase their respiratory minute volume to the required levels at all, or the respiratory effort required to increase the minute volume is so exhausting that they are unable to sustain the required increased respiratory minute volume and develop respiratory failure. How can these patients be detected? How can we get an idea of the maximum sustainable minute volume of a patient? Which patients are most likely to develop respiratory failure due to a requirement for increased minute volume? Maximum minute volume (MMV), also known as the maximum breathing capacity (MBC), is the maximum volume of air able to be displaced by the lungs in one minute. Most modern lung function testing procedures never measure this. However, a rough approximation of the MBC can be made by accepting the clinical fact that the maximum respiratory rate in an adult is about 35 breaths/minute, and that the FEV1 determines the maximum amount of air able to be displaced per breath. In other words the MBC = Respiratory Rate x FEV1 = 35 x FEV1. So for a person with an FEV1 = 2000 ml, the MBC = 2 x 35 = 70 l/min. However, no one can maintain such a respiratory minute volume for long periods, and clinical experience reveals that for people with serious COPD, the sustainable respiratory minute volume is about 50-60% of the MBC (Zocche-1960). So what is the maximum sustainable respiratory minute volume, and at what levels are people likely to develop respiratory failure? So let us examine a clinical example applying these facts about the MBC and the maximum sustainable respiratory minute volume. Consider an adult with severe COPD, with an FEV1 = 800 ml, a respiratory rate of 18 breaths per minute, and a tidal volume of 400 ml/breath. This adult will have a resting respiratory minute volume of about 7.2 l/min, and an MBC = 35 x 0.8 = 28 l/min. All these things mean that as the maximum sustainable respiratory minute volume is 50% of the MBC, then the maximum sustainable respiratory minute volume of this patient is about 14 l/min, which is not so much different from the resting minute volume. The respiratory reserve for this hypothetical patient is minimal, only 14 - 7.2 = 6.8 l/min. This is clinically very significant. Such a person has a very large chance of developing respiratory failure due to exhaustion resulting from increased respiratory work required as a result of postoperative pulmonary complications. The clinical consequence of all this can be summarized as below. Patients with a calculated or measured MBC ≤ 30-40 l/min are at high risk of becoming exhausted and developing respiratory failure due to exhaustion should they develop postoperative pulmonary complications. Postoperative respiratory support on an intensive care is required for such patients after intra-abdominal, or other major surgery. All the above are predictors of postoperative pulmonary complications. The Arozullah point-scoring system goes one step further - it used the data from extensive prospective analysis of many thousands of operations to derive a point-scoring system predicting the likelihood of respiratory failure. As such the Arozullah point-scoring system is a valuable supplement to all the above (Arozullah 2000). All the above can be summarized in an insightful and clinically usable table of parameters available on most respiratory function testing data sheets to answer the 4 most important quesions about perioperative respiratory function. When supplemented with a clinical and functional history, all the above provides a logical step-by-step approach to assessing the risk of developing postoperative pulmonary complications and respiratory failure.